Hi there! Heather Lloyd Martin here. Is SEO copywriting part of your job description? Maybe you work for an SEO or an ad agency, and you need to write high-positioning copy that makes more money for your clients. Or maybe you’re working in-house, and you need to know how to improve your company’s search visibility. Either way, you’re the one responsible for writing fantastic SEO content…and people look to you to make their rankings and conversion rates skyrocket. You may be having problems keeping up with the ever-changing SEO news and techniques. Plus, you may be afraid that you won’t write content “the right way.” You heard that Google clamped down on “thin” content – and you need to make sure you’re writing Hummingbird and RankBrain-safe pages – not something that the search engines will kick out of their index. Thanks to my program, dozens of in-house copywriters from all skill levels — even those who tried SEO copywriting before —are now working as confident, Certified SEO Copywriters for their companies. Only $995 - Get Started Today! Throughout my 20-year SEO copywriting career, I’ve literally trained thousands of people worldwide on how to write for better search engine rankings. I’ve lectured at the Darden School of Business, Search Engine Strategies, SMX, Small Business Marketing Unleashed, PubCon and a host of other events. Plus, I’ve helped companies of all sizes, from Fortune 50 retailers, search engines and publishers to financial services and travel destination sites. SEO copywriting is complex. But we can make it fun, too. I’ll lead you through every step of the way. Become known as the in-house “SEO copywriting expert,” providing trusted guidance to your IT, marketing and branding departments. See your company’s search engine rankings go from nowhere to top-positioned because of your work! Improve the sales-potential of every web page, contributing important value to your company’s success. Expand your professional abilities and your resume, so you can move up the career ladder. Help your company make an incredibly affordable investment in YOU as their in-house secret weapon… versus hiring an outside resource charging much more in professional fees. No matter how much experience you have as a web copywriter, I promise that you can master SEO copywriting skills and deliver the valued in-house services your company needs right now. Thanks to my program, dozens of in-house copywriters from all skill levels — even those who tried SEO copywriting before — are now working as confident, Certified SEO Copywriters for their companies. “After helping put together a little (albeit brief) how-to/intro to SEO copywriting for my copywriter cohorts, I was very excited to be the “hero” and do that. I can’t believe I tried for a few years to learn this stuff on my own!” – Jessica Pairrett, Ecommerce Copywriter, The Bon Ton Stores, Inc.
It’s your own “personal on-call professor” – with lifetime access! This is so much more than a basic SEO training course, conference or how-to ebook. As you follow my path to earning your SEO Copywriting Certification, think of me as your friendly personal guide, taking you through every step. I show you exactly how to create solid content for any web page using SEO best practices and my own tested methods. Plus I invite you to listen in on SEO expert interviews, answer your via email to help you complete the program successfully in no time. Sooner than you think, you’ll know how to combine direct response copywriting, SEO guidelines and consumer psychology in a masterful way. As a result, you’ll quickly nail this highly valued skill! How can you get top-10 search rankings for your company? Yes, you really CAN make a difference as an effective Certified SEO Copywriter. And the best news is — you don’t have to be a Web “techie.” If you can write to sell, you can do this! I’ve untangled the geek speak so you can easily write for search engines and propel your client’s web traffic in easy-to-understand language. Simply follow my 8 training modules, complete with my step-by-step guidance and real-world examples – and if you need help, I’m just an email away. You’re just a few weeks away from boosting your career as a Certified SEO Copywriter — and wowing your colleagues with amazing results! Here’s how the program works. Learn when it’s convenient for you. Go through 8 exclusive SEO Copywriting Certification Program modules — over 130 pages, available 24/7! Plus, you can download four years worth of recorded educational podcasts – with more added each month so you have the latest insights. Lifetime access means you can relax. Fit the training in when you have time — the lessons are always there and waiting for you. When something changes in the industry, I’ll update the materials and let you know. You’ll always be in the loop. Twice a month, my guests and I will answer your questions in real-time, guide your progress and be with you every step of the way. If you can’t attend a call, you can download the mp3 and review it when you have time. Whatever fits with your schedule. Heather clearly has a passion for SEO and her excitement is contagious. This intense program includes study manual, podcasts, phone meetings, white pages, and Heather’s amazing accessibility for “how to” questions. I highly recommend Heather’s SEO Copywriting program for anyone working in or desiring to work in the e-commerce field.” — Heather Georgoudiou, Revenue Performance. Twice a month my guests and I will answer your questions in real-time, guide your progress, and be with you every step of the way. People love the conference calls – whether they download them from the training site or participate live. In fact, quite a few of the in-house folks taking the training are now online friends. That sense of community – of being able to chat with someone who really understands what it’s like to work in-house – makes all the difference. 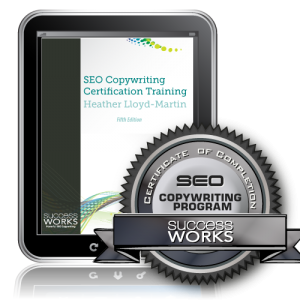 Determine your own pace of earning your SuccessWorks SEO Copywriting Certification. Depending on your schedule, you may complete the program in 3 weeks or a few months. Plus you’re never alone. As a SuccessWorks Program participant, you can access our exclusive Facebook group to ask your questions and network with other writers. Ace the final quiz to confirm that you’ve learned SEO Copywriting fundamentals. After reviewing my clear, easy-to-follow steps, you’ll find it challenging yet fun to take the quiz. Wow your web team (and your boss) with your Certified SEO Copywriter Badge and Certification. When you’ve completed the program and taken the quiz, you can showcase your mastery by framing your certificate and hanging it on the wall! Plus you can place our badge on your resume. Review the SEO Copywriting Certification course syllabus. SEO Copywriting Certification Training program delivers the best return on your company’s training investment. This industry-endorsed SEO Copywriting Certification Training program delivers the best return on your company’s training investment. This is the ONLY legitimate SEO Certification program focused 100% on copywriting, and it’s endorsed by two of the most respected Web and copywriting industry leaders: SEOPros.org and AWAI (American Writers & Artists, Inc.). If your company sent you to a conference, they’d be paying at least $2,000 for registration. Plus, there’d be the cost of airfare, hotel, meals…the list goes on and the tab keeps climbing. By the time it’s all said and done, one conference (where you’d be one face among hundreds) would cost your company $3,500 or more (and only a portion of the training would cover SEO Copywriting anyway). For less than 1/4 of that price, you’ll get the training your company really needs for the best possible success. You’ll be a fantastic in-house secret weapon providing daily value to your company. 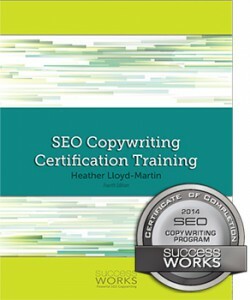 I designed my SuccessWorks SEO Copywriting Certification Program to include 8 all-inclusive modules, frequent podcasts for extra learning, a secure, password-protected Members Forum, a weekly SEO Copywriting roundup, expert teleconferences and personal access to me — all from the comfort of your computer chair — for just $995 complete. Heck, that’s probably one of the least expensive and most valuable training budget items your company will invest in all year! Learn how to write sizzling optimized pages that convert like crazy. Remember, I’ve outlined all my secrets – the secrets that took me over 20 years to learn – in my SEO Copywriting Certification Program. And now, you can sign up for just $995. Not sure? Check out these testimonials from happy graduates! Still not sure? Give me a call at (503) 476-1065. I’m happy to answer your questions. P.S. 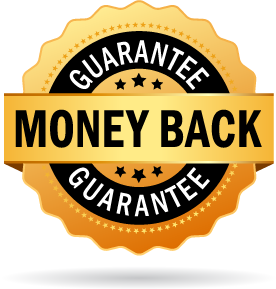 I’m so confident you’ll love this SEO Copywriting Certification Program that I’m offering you a 72-hour, no-hassle, money-back guarantee. Take a good look at what the program has to offer. If you don’t like the program and let me know within the first 72 hours, I’ll refund your money — no questions asked. You have nothing to lose — it’s risk-free! Don’t delay your success any longer. Sign up today! Only $995 – Get Started Today!